Techniques of survival medicine include everything from stopping a wound from bleeding to performing sutures to close a gaping gash. Lack of traditional medical resources normally provided by trained doctors and nurses may not be available following a catastrophe or if you become lost in a remote wilderness. Therefore, you should know how to administer adequate care for cuts, broken bones, shock and other potentially fatal health emergencies. Foremost among the many problems that can compromise your survival ability are medical problems resulting from unplanned events, such as a forced landing or crash, extreme climates, ground combat, evasion, and illnesses contracted in captivity. Survivors have related feelings of apathy and helplessness because they could not treat themselves in this environment. The ability to treat yourself increases your morale and aids in your survival and eventual return to friendly forces. Applying pressure to the wound until the bleeding has stopped usually controls external bleeding. If bleeding continues after 30 minutes, use a pressure dressing, which is a thick piece of sterile gauze applied to the wound and then fixed in place by tightly wrapping a bandage around the wound. However, after you have applied this pressure dressing, do not remove the dressing, even though the dressing might become blood-soaked. Wait one to two days before removing the dressing and replacing it with a fresh dressing. Monitor the wound for any signs of infections, such as swelling, redness, pain and foul-smelling seepage. Always elevate bleeding extremities above the heart to help reduce blood loss. This also facilitates blood return to the heart and decreases wound blood pressure. Although this procedure applies in the majority of injuries, it does not apply to snakebites. An arm or leg sustaining snakebite should be lower than the heart to lessen the potential for heart attack induced by poison. 4-35. Severe bleeding from any major blood vessel in the body is extremely dangerous. The loss of 1 liter of blood will produce moderate symptoms of shock. The loss of 2 liters will produce a severe state of shock that places the body in extreme danger. The loss of 3 liters is usually fatal. Place the tourniquet about two inches above the wound; never place it over the wound. Use a thin stick or other similarly shaped item to tighten it just enough to substantially reduce blood flow. 4-50. After you secure the tourniquet, clean and bandage the wound. A lone survivor does not remove or release an applied tourniquet. However, in a buddy system, the buddy can release the tourniquet pressure every 10 to 15 minutes for 1 or 2 minutes to let blood flow to the rest of the extremity to prevent limb loss. Treat suspected incidences of shock by elevating legs at least six or seven inches above the body. Make sure the patient is in dry clothes and warm the patient with blankets, shelter or fire. If the person in shock is conscious, provide small cups of warm sugar or salt water. However, do not administer fluids if the person has an abominable wound or is unconscious. Survival medicine techniques for bites and stings include immediate removal of the venom sac or stinger by gently scraping with a razor blade, sharp knife blade or even your fingernail is nothing else is available. Apply antibiotic ointment and watch for symptoms of allergic reaction. To relieve itching, use dandelion sap, crushed garlic or a cold compress. While snakebites are rare, most people do not die from snakebites but bites frequently become infected due to bacteria in the animal's saliva. Nonpoisonous snake bites reveal teeth rows on the skin while poisonous snakebites will show fang as well as teeth punctures. Clean the bite, remove any rings or bracelets in the event swelling occurs and keep the patient as calm and still as possible. Remove the tick promptly and carefully. Use tweezers to grasp the tick near its head or mouth and pull gently to remove the whole tick without crushing it. Other methods — such as applying petroleum jelly, fingernail polish, rubbing alcohol or a hot match — aren't recommended. 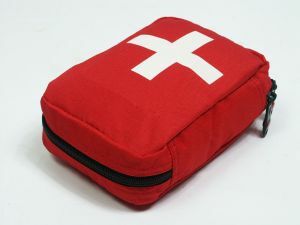 Many other medical procedures can greatly enhance the potential to survive an emergency and should be learned as part of any survival-training program. In a survival situation, where medical assistance may not be available, you are going to have to make do, recognize symptoms, and possibly even come up with natural herbal or folk remedies to treat certain conditions.